While in Denmark I had an idle moment in the presence of a postal Nihola. 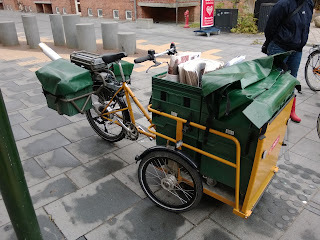 The postal service in Denmark has purchased perhaps a couple of thousand of them. Its an interesting design, and the parts that they didn't change from a regular Nihola are interesting to note. 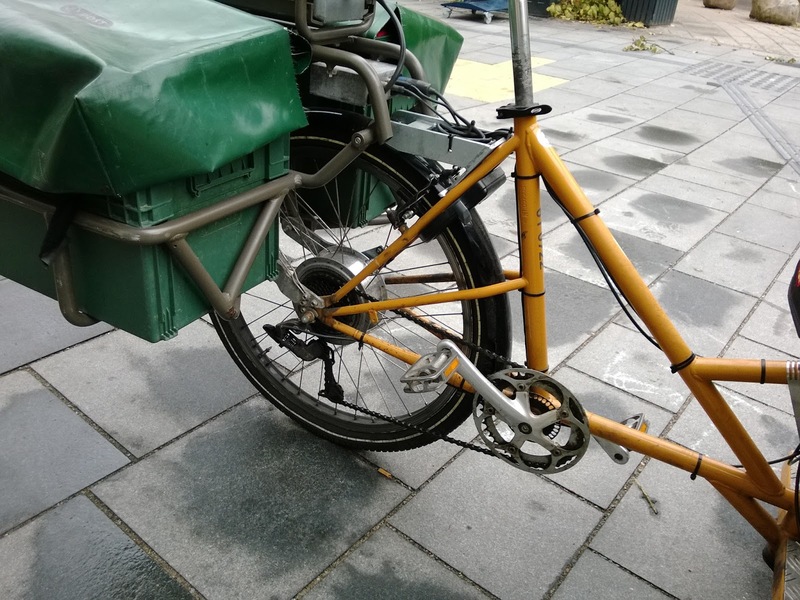 A postal Nihola is mostly a standard model with a different front end. Basically the front is swapped out for a float-loading platform, there is some modification to the frame where the rider steps over, and the rear has a gargantuan cargo rack bolted on. They use an electric-assisted derailuer system, with what looks like an above-average motor, rim and tire. But importantly, the rear frame and steering are hardly changed from a regular "little" Nihola. The rear rack is epic, and the frame is modified for a lower stand-over height. Also interesting is that they didn't go with a classic box box trike like Christiania. They have a small number of such trikes already, and apparently did not find them to be the right choice.